Provide a unique climbing experience with the Steeple Climber by Swing-N-Slide. This climber provides a fun way to get kids moving by promoting coordination, balance and strength. Kids are sure to have fun playing in the back yard with this and they can climb to their heart's content. Covered sandboxes from Creative Cedar Designs are the perfect addition to your backyard play equipment! Make your children's sandbox a central fixture of the neighborhood with hours of safe, collaborative play. Do it yourselves sandbox kit requires no special tools and includes sand box panels, seat boards, hardware, liner, cover and sand box plans with play-safe installation checklist. The Frame It All 4ft.x4ft.x13.5inch Collapsible Square Sandbox Canopy protects your sandbox from rain and debris, or from being used as a litter box by neighborhood cats or other animals. The domed construction prevents water pooling which can help prevent a mosquito breeding ground. Collapsible construction makes it simple to set up or to store away in seconds. Corner connectors fasten the cover securely to the sandbox frame. Velcro flaps prevent animal intruders. The 4ft. x 4ft. square cover integrates with any 4ft. x 4ft. square Frame It All sandbox. Sandbox not included. The Frame It All 7ft.x8ft.x13.5 inch Collapsible Hexagon Sandbox Canopy protects your sandbox from rain and debris, or from being used as a litter box by neighborhood cats or other animals. The domed construction prevents water pooling which can help prevent a mosquito breeding ground. Collapsible construction makes it simple to set up or to store away in seconds. Corner connectors fasten the cover securely to the sandbox frame. Velcro flaps prevent animal intruders. The 7ft. x 8ft. hexagon cover integrates with any 7ft. x 8ft. hexagon Frame It All sandbox. Sandbox not included. Steeple Climber Provide a unique climbing experience with the Steeple Climber by Swing-N-Slide. This climber provides a fun way to get kids moving by promoting coordination, balance and strength. Kids are sure to have fun playing in the back yard with this and they can climb to their heart's content. Steeple Climber is rated 4.2 out of 5 by 18. Rated 5 out of 5 by Jenna from This climbing ladder is great for my 6 and 8... This climbing ladder is great for my 6 and 8 year old kids. The neighbors love to come over and use it also. Rated 5 out of 5 by Wirtco from It worked great.... It worked great. Rated 4 out of 5 by Grace from Kind of pricey for the quality. It really is... Kind of pricey for the quality. It really is over priced. Had I seen it in the store, I would not have bought it unless it was on sale. Rated 4 out of 5 by Josh from Overall it's good and my kids love it. I wish... Overall it's good and my kids love it. I wish it had a better way to tie the ropes to the ground stakes, but it's still a good add on to the playset. Rated 5 out of 5 by P2Arizona from The Swing-N-Slide Playsets Steeple Climber is an excellent addition to... The Swing-N-Slide Playsets Steeple Climber is an excellent addition to our existing playset. 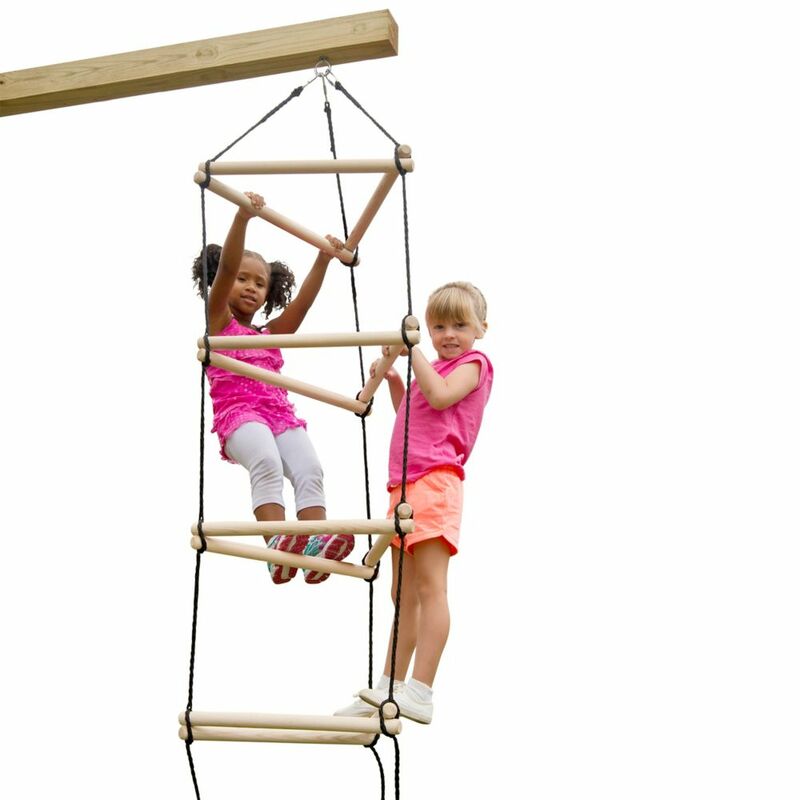 The kids love to climb, and this item is perfect. They can climb on the inside or on the outside of the Steeple Climber. The Climber is well made and it comes with ground stakes to help stabilize it.